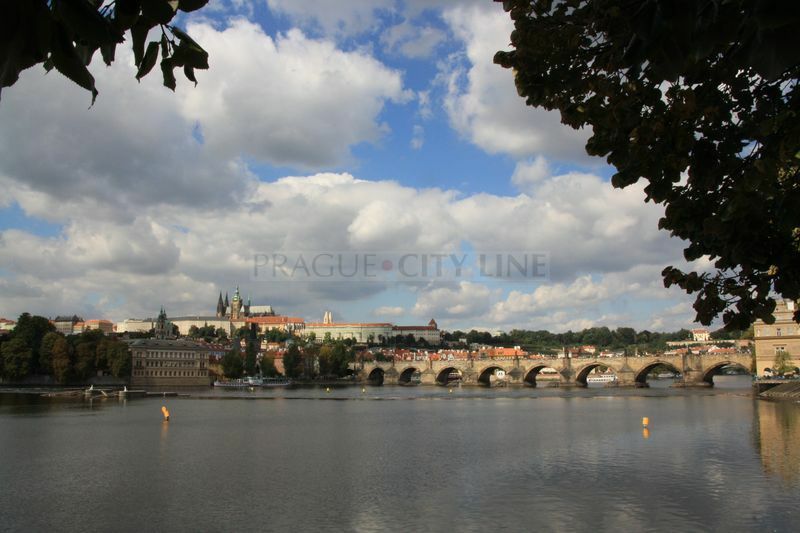 Prague City Line » Prague Castle is an unmissable part of any visit to the Czech capital. 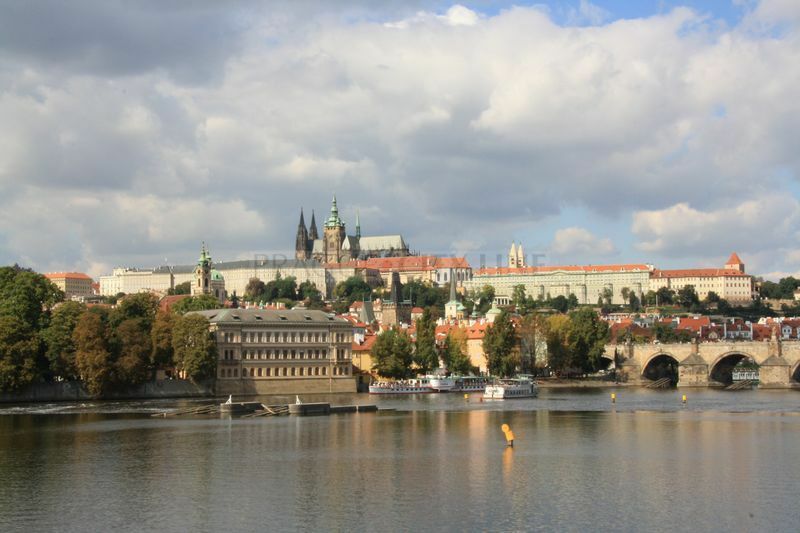 Prague Castle is an unmissable part of any visit to the Czech capital. It symbolises a thousand years of history. It was founded in 880 – 890 as a Romanesque fort, the remnants of which can still be found under the paving stones on the third courtyard. A tour of the complex includes such remarkable buildings as the Cathedral of St Vitus, which dominates the Prague skyline, the Royal Palace, the Convent of St George with its Romanesque walls, Golden Lane, where you will wonder how people could have lived in such a limited space, the famous art collection of Rudolf II and many more fascinating places. Those tired after a long tour can retreat to the Royal Gardens, a fine example of Renaissance landscape gardening. Visitors enter the first courtyard through a baroque gate guarded by two giant statues by Ignác František Platzer dating from 1769. For centuries a moat divided the castle from Hradčanské Square where the gate now stands, and the castle could only be accessed across a drawbridge. This natural ditch was one of three moats that originally protected the castle. The other two were man-made and encircled the other courtyards. The first courtyard is closed in by palace buildings which Empress Maria Theresa had constructed. Building work on this Rococo court was taken on by the Viennese architect Nicollo Pacassi. 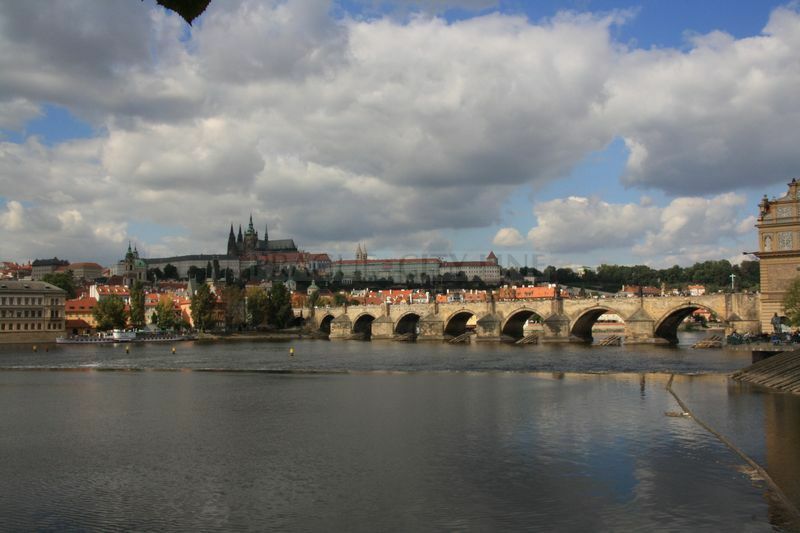 It was decided to preserve the Matyáš Gate, one of the first baroque structures in Prague and the original entrance to the castle, erected in 1614 by Giovanni Mario Fillipi. In front of the gate stand two huge flagpoles made of several pine tree trunks. From the passageway between the first and second courtyard a staircase leads off up into the representative rooms of the castle. These are now used by the Czech president as audience chambers. The staircase to the left leads up to the Spanish Hall. As with the first courtyard, the current appearance of the second courtyard is the work of Maria Theresa’s court architect Niccola Pacassi. This courtyard was originally created in the 16th century on the site of the second moat. Most of the northern section of the courtyard was built during the reign of Emperor Rudolf II. First of all, stables on the ground floor where created and several years later the Imperial Palace was added on the opposite side. Rudolf II was a great lover of the arts and he earmarked many of the castles rooms to house his collections. Soon these rooms were bursting at the seams, so he decided to add another floor above the stables and store a part of his collection there. On the first floor he had another two grand Renaissance halls built – the Spanish Hall and the Gallery. The Prague Castle Picture Gallery, which now houses a fraction of Rodolf II’s famous collection, is situated in what used to be the stables. During reconstruction work carried out on the stables, the remnants of the first church at Prague Castle dedicated to the Virgin Mary were discovered. 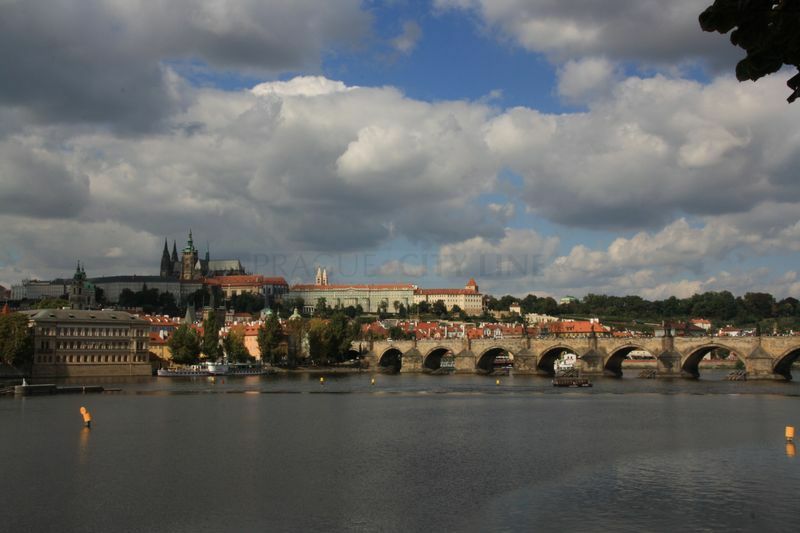 Built in the 9th century, this was only the second Catholic church to be established in the Czech lands. PRAGUE CASTLE PICTURE GALLERY The gallery was ctreated from Rudolf II’s stables in 1965 and houses a part of the emperor’s original art collection. Rudolf II was a highly educated man for his times. It is known that during his reign he surrounded himself with an assortment of creative individuals such as painters, sculptors, various craftsmen, astronomers, alchemists and doctors. He had a great interest in art as well as science, especially types of science which had a hint of magic and quackery in them such as alchemy and astrology. During his reign he collected an incredible 3,000 pictures by the best artists of the day. He owned a unique collection of works by Dürer, Bosch, Brunghel the elder, Leonardo, Tizian, Raffael, Cranach and Tintoretto. His collections also contained various artefacts, gold, minerals, clocks, astronomical and measuring equipment, mechanical toys, an extensive library, stuffed animals and various rare curios such as a perpetual motion machine, a unicorn’s horn, a mandrake, a giant’s shinbone… and the list goes on. His art collection was one of the largest in the world at the time. His collection of precious stone was one of the most valuable. Rudolf II had plans to create a kind of universal museum from his collection called the ‘encyclopedia of the visible world’. Many eminent artists also worked at Rudolf’s court, such as painter Hans von Aachen and the sculptor Adrien de Vries. Another was the Italian painter Giusepe Arcimboldo, known around the world for his paintings of animals, flowers and vegetables. The famous astronomers Tychon de Brahe, Jan Kepler and G. Bruno also worked for the emperor. And we should not forget the alchemists who, though nowadays surrounded in a mist of secrecy and witchcraft, are considered as pioneers in the field of physics and chemistry. Rudolf himself possessed a great deal of knowledge in this area and often took part in experiments. Rudolf was also a very eccentric ruler and in his passion for art and science, often forgot to rule. His approach to being emperor indirectly led to the outbreak of the Thirty Years War and to the subsequent break-up of his beloved collections. At the end of the Thirty Years War in 1648, a large amount of objects from Rudolf’s collections were stolen by Swedish troops. 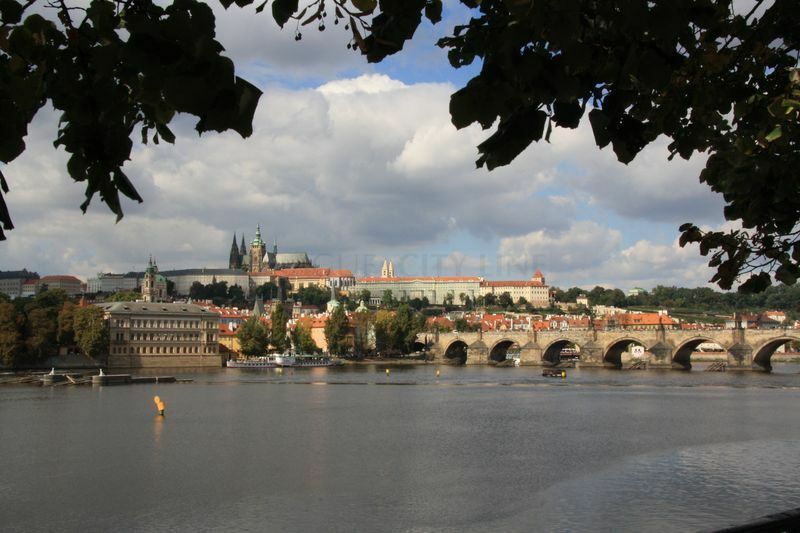 However, you can still a part of the collection in the Prague Castle Picture Gallery. Some of the most noteworthy works of art on display are The Young Woman at her Toilet by Tizian, Tintoretto’s The Whipping of Christ and Rubens’s Assembly of the Olympic Gods. Other works by Master Theodoricus, Paolo Veronese, Hans von Aachen, Domenico Fetti, Bartolomeo Spranger, Jan Kupecký, Petr Brandl and many others can also be viewed. THE SPANISH HALL The famous Spanish Hall, built on the orders of Rudolf II in 1602 –1606 on the first floor of this wing of the castle, was at the time the largest secular room in the castle. Unfortunately it has not survived in its original entirety. It was given a neo-baroque facelift in preparation for the coronation of Emperor Franz Josef I as Czech king, an event which never took place. The hall is 48m long, 24m wide and 12m high. Passing through a passageway in the east wing we reach the third courtyard, around which are grouped the oldest parts of the castle complex. Even here, buildings from various periods were united behind one façade by Pacassi. The entire courtyard was paved in the 1920s, under which the remnants of the original medieval structures can be found, such as a small 12th-century church and graveyard. The most significant building on the courtyard is the largest Christian place of worship in Prague, the Cathedral of St Vitus, containing the tombs of Czech kings and the crown jewels. 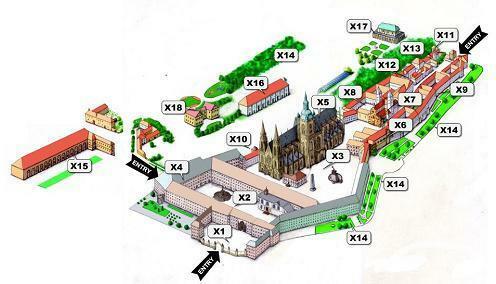 The Gothic Cathedral of St Vitus dominates the whole courtyard and is the most distinct medieval building in Prague. A stone rotunda founded in 926-929 and then a Romanesque basilica from 1085 used to stand on the site of today’s cathedral. Charles IV had the basilica demolished, and decided to build a cathedral in its place. Firstly, he wanted to create a symbol of his power, and secondly the Prague bishopric had been promoted to an archbishopric during his reign, and every city at the centre of an archbishopric needed a cathedral. 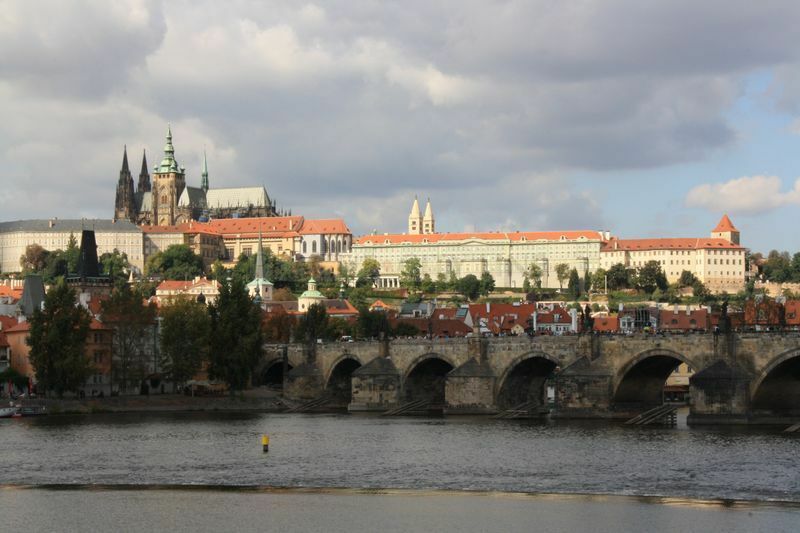 So in 1344, Charles IV gave the order for a cathedral to be built. The first architect to work on the building was Matyáš z Arrasu, who completed the eight chapels at the end of the cathedral. When he died in 1352, Petr Parléř from Gmünd in Austria continued the work. By the time of his death in 1399, he had managed to complete the remaining parts of the chapel, establish the gallery, put a roof over the choir and put up temporary walls. The cathedral at the time of Petr Parléř was only half the size it is today and work stopped for 500 years. Not until the 19th century was the Union for the Completion of the Cathedral of St Vitus founded, and it was 1929 before the architects Josef Kranner, Josef Mocker and Kamil Hilbert completed the building. 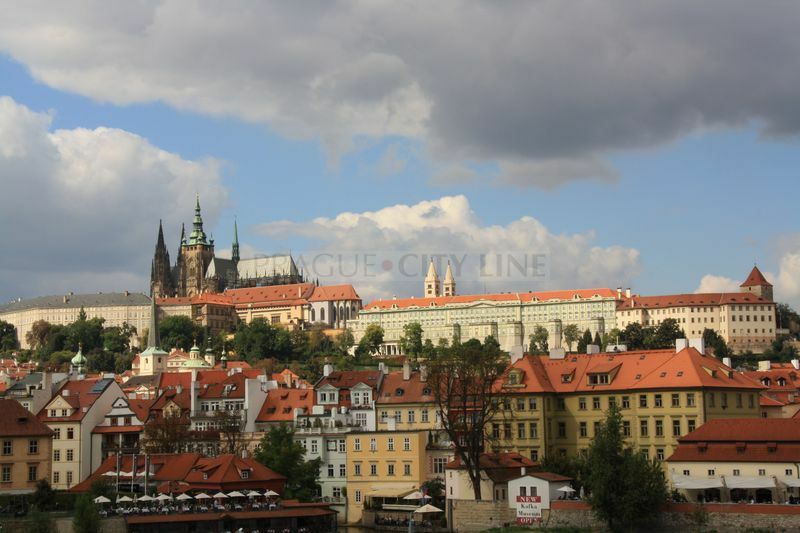 The Cathedral of St Vitus is 124m long, 33m high and 60m wide at its widest point. It is a triple nave cathedral with two side naves and a wreath of choir chapels overhead. 28 pillars support the amazing vaulted ceiling. 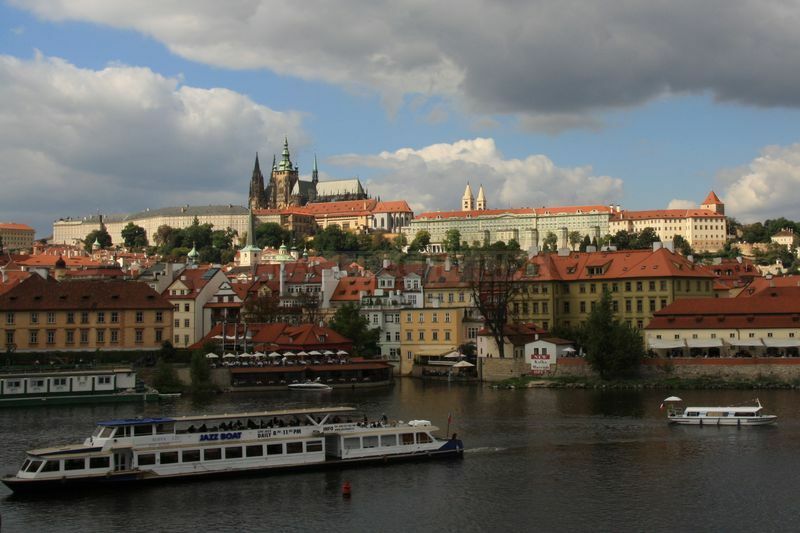 The tower is 96.5m high and is topped with a Renaissance spire, atop which stands a 3.5m high Czech lion. The largest bell in the Czech lands dating from 1549 and weighing 16.5 tons hangs in the tower. THE CATHEDRAL DECORATION: The entrance to the cathedral is through the western façade, over which rise two 82m-high towers on both sides. The doors bear scenes in bronze from the history of the cathedral and the lives of SS Wenceslas and Adelbert (Vojtěch). In the middle of the façade one cannot fail to notice the rose window showing the Creation of the World by František Kysela in stained glass. The original entrance to the church was through the Golden Gate comprising of three doors (representing the three gates into Jerusalem according to St John), above which glitters an extremely valuable mozaic depicting the Last Judgement dating from 1370 – 71. The mozaic is made of pieces of glass and stone and features Christ, the Virgin Mary, St John, the Czech patron saints, the apostles and Charles IV, the founder of the cathedral with his fourth wife Eliška Pomořanská. THE CATHEDRAL INTERIORS: The interior of the cathedral is very richly decorated. On entering, look up to admire the beautiful vaulted ceiling. This type of vaulting, called net vaulting, was used here for the first time in central Europe by architect Petr Parléř. At the same height as the first gallery we see the most important series of Gothic statues – a kind of portrait gallery depicting 11 members of the royal family, 3 archibishops, 5 heads of the building project and the first two architects to work on the cathedral. If you continue to the southern side of the cathedral, around halfway along you will reach the most beautiful chapel, the Chapel of St Wenceslas. It was created in 1362 – 1367 and is the work of Petr Parléř. The chapel contains the remains of St Wenceslas. St Wenceslas’s grave has remained in the same place since his death in 935 despite the church which surrounds it having been rebuilt several times. The chapel is adorned with 1345 semiprecious stones and Gothic murals, probably by Mistr Theodoricus from the 14th century and paintings from the 16th century depicting the life of St Wenceslas by the creator of the Litoměřice altar. St Wenceslas’s grave and a statue of him dating from the 14th century are also situated in the chapel. There is also a green basket which, it is said, was used in divine judgements. The individual on trial had to prove his innocence by putting his hand into burning coals in the basket. If he did not burn himself, he was deemed innocent. Of course, it often happened that innocent people who relied on the miraculous basket, got badly burnt and were declared guilty. This practice was abolished by Charles IV, but the basket stayed in the Chapel of St Wenceslas. Under the windows of the chapel visitors will see a small door leading to the steps to the chamber containing the crown jewels, situated above the chapel. In the chamber protected by seven locks (seven different people in important office in the Czech lands each hold a key), lie the crown jewels – a crown, the only one in Europe to be shaped like a hat – a sceptre, an orb, a coronation sword and a cross. The most famous of these objects is the crown of St Wenceslas, which Emperor Charles IV had crafted in 1346. Charles placed great emphasis on maintaining old royal traditions and so the crown was dedicated to St Wenceslas, the patron of the Czech lands, on whose head it would be kept. 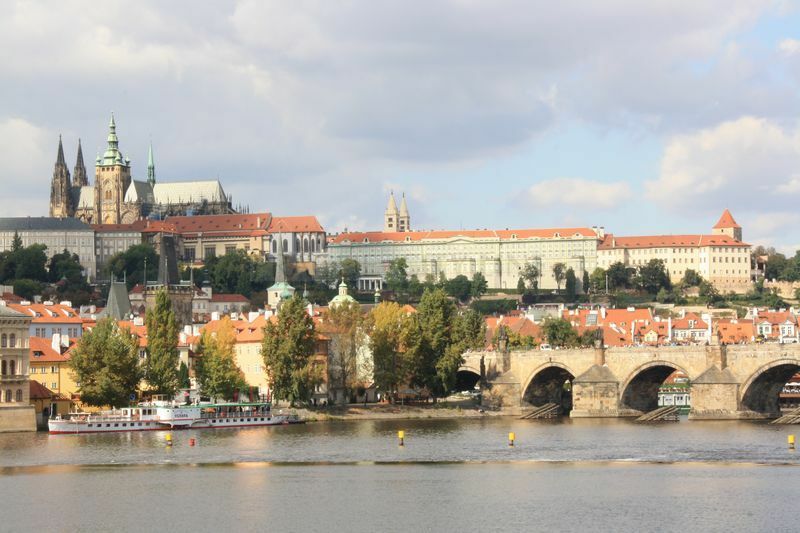 It could be taken off only on the occasion of the coronation of a new king or for very special occasions where the king was present, and only in Prague and the immediate surroundings. After the coronation the king was allowed to keep the crown for just one day before returning it to the head of St Wenceslas. The crown is made of 22 karat gold, and is decorated with 95 precious stones and 20 pearls. Some of the stones are the biggest examples on the planet. The crown jewels are only displayed on very special occasions. Behind the Chapel of St Wenceslas are more steps which this time lead to the royal tomb where Emperor Charles IV is buried alongside his four wives. Here visitors can also see the foundations of the old Romanesque rotunda and basilica. At the end of the cathedral we find more Gothic graves of Czech princes and kings of the Přemyslid dynasty such as Přemysl Otakar II, Břetislav I, Břetislav II, Bořivoj II and Spytihněv II. There are also the graves of the first Czech archbishop Jan Očko z Vlašimi and the builders of the cathedral itself Matyáš z Arrasu and Petr Parléř. The tomb of St John of Nepomuk dating from 1736 is made of solid silver. In front of the main altar we find the part of the royal tomb which is above ground. It is the work of Dutch sculptor Alexander Collin and dates from 1571-89. The main neo-Gothic altar dates from the time when the cathedral was being completed. To the right of the main altar visitors will find the royal oratory from 1493, decorated with intertwining branches, the symbol of Vladislav Jageillon, as well as symbols from the countries he ruled over. The Renaissance organ loft by architect Bonifác Wohlmut dates back to 1557 – 1561, and was originally situated on the western side of the cathedral. It was moved to the northern side of the side nave when the cathedral was being finished at the beginning of the last century. In the centre of the old part of the cathedral we find the tomb of the first Habsburgs to sit on the Czech throne. Once again, the sculptor is Dutchman Alexander Collin. Emperor Ferdinand I, his wife and his son Maxmilián II are all depicted. This is the most interesting part of the cathedral packed with decoration and interesting works of art wherever you look. The statue is a copy of the Gothic original which is stored at the National Gallery. The Original was made in 1373 by Jiří and Martin z Kluže. It was one of the first free standing statues in the Czech lands, as at the time it was the custom to attach statues to churches and monasteries. This meant that it was only necessary to complete the front of every statue. The 16m-high monolith has stood here since 1928 and commemorates the victims of World War I. 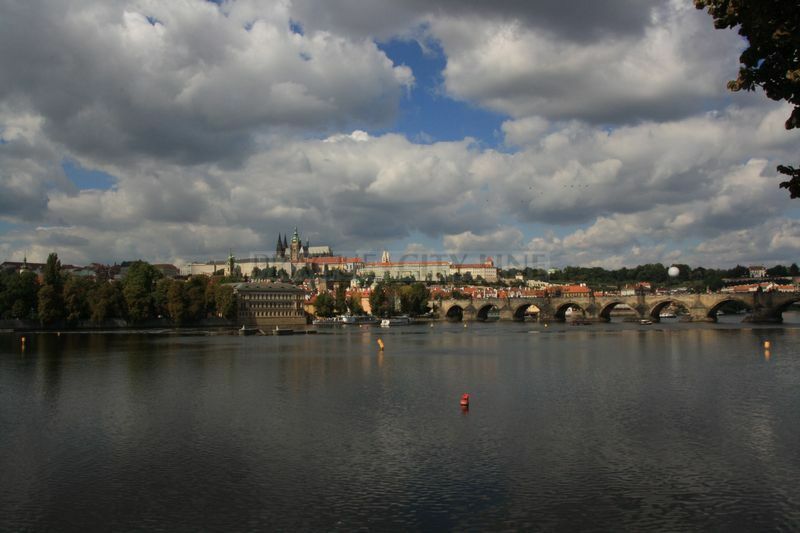 It was erected to mark the 10th anniversary of the declaration of Czechoslovak independence. 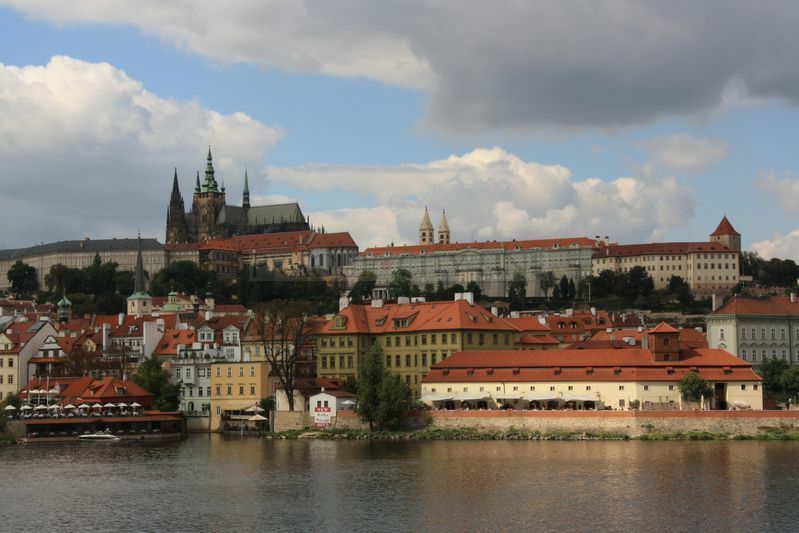 The Old Royal Palace is situated to the south of the Cathedral of St Vitus and is one of Prague Castle’s oldest structures. Over the course of its long history it has been the scene of several significant events. During the Habsburg rule it housed state offices. In 1618 the so-called Prague defenestration took place here, and in 1621 the death sentence was passed on 27 anti-Habsburg rebels. The palace was built in three stages over many centuries. As early as the 11th century a Romanesque palace stood on the site. That building now forms the cellars of today’s palace. Přemysl Otakar II and later Charles IV built new floors on top of the Romanesque palace, and these now constitute the lower floors. A striking feature built at this time is the Gothic arcading on the north side of the courtyard. The All Saints Chapel was also added at this time which is now joined to the western end of the palace. The most important period in the development of the palace came during the reign of Vladislav Jageillon at the end of the 15th century when the architect Benedikt Reid worked on its reconstruction. He linked up the earlier spaces where Charles IV had resided and created the largest medieval secular space of its day in Europe – the Vladislav Hall. THE VLADISLAV HALL: This is the most important part of the palace, and is still the venue for important events such as the election of new presidents. The hall is 62m long, 16m wide and 13m high. The windows and entrances are Renaissance in style, while the ceiling is late Gothic. Benedikt Ried, who worked on the building for Vladislav Jagiellon from 1486-1502, is responsible for this blend of styles. The Vladislav Hall used to be called the Great Throne Hall, and was originally created for special occasions such as coronations, feasts and even jousting tournaments. The knights would enter the hall on horseback via the Riders’ Stairs which lead from the Square of St George and pass into the hall through a special entrance. During the reign of Rudolf II, art markets used to take place here. Now the hall is used for important state occasions. The Basilica of St George is the best preserved Romanesque place of worship in Prague. The only ‘blemish’ on the purely Romanesque character is the baroque façade from the 17th century. The twin spires of the basilica are a well-known sight. They are not of the same proportions; the south spire (named Adam) is larger, the north spire (Eva) is slimmer. Inside the basilica in the apse on the north side visitors can see the remnants of Romanesque murals and a Gothic statue of the Virgin Mary and Christ. A double baroque stairway leads us from the nave up into the presbytery, which ends in a semicircled apse. The vaulting above the presbytery still bears late Romanesque frescoes from the mid 13th century. During renovation work, the graves of some Czech princes from the 10th and 11th centuries were discovered in the basilica. The tomb of St Ludmila, Přemyslid dynasty princess and patron saint of the Czech lands who was murdered in the 9th century, is also situated in the basilica. The baroque chapel of St John of Nepomuk is attached to the basilica on the southern side, and a statue of the saint by Brokoff can be seen on the facade. The Convent of St George – the first convent in the Czech lands – was founded next to the basilica in 973. The convent was a centre of scientific research and housed an important scriptorium (a room where manuscripts were copied) where a number of medieval illuminated manuscripts were produced. The convent was such an important place that the abbess had the right to crown Czech queens alongside the archbishop. The convent, rebuilt many times over, was finally abolished in 1782 and made into an army barracks. 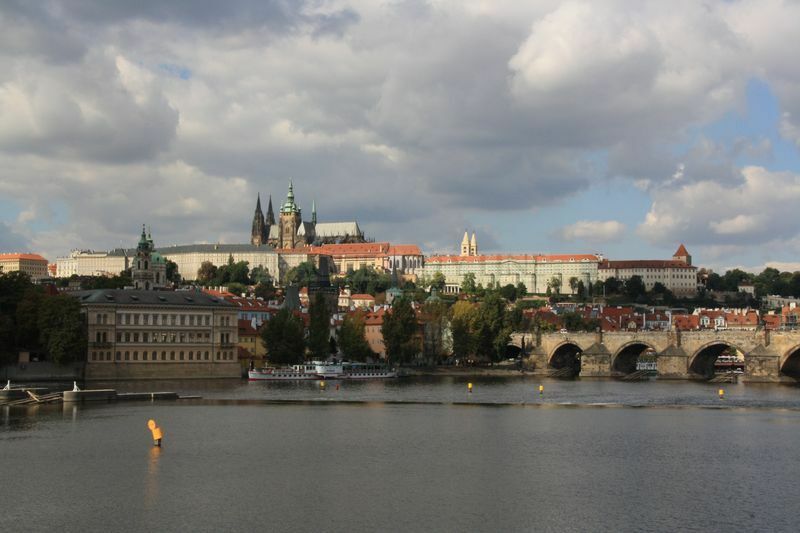 In 1962-74 it was renovated to house the National Gallery’s collection of Czech art from the Gothic, Renaissance and baroque periods. THE ART COLLECTION OF THE CONVENT OF ST GEORGE: The art collections at Convent of St George are organised in chronological order according the various periods. The ground floor houses Czech art from the 14th century, the second floor continues with collections from the 15th and 16th centuries, and the third floor holds manyrist and baroque works. Highlights of the collection include St Elizabeth, a 14th-century panel painting by Master Theodoricus, who decorated the famous Chapel of the Holy Cross at Karlštejn Castle; a selfportrait by Jan Kupecký from 1711 and The Speaking Apostle from 1725 by the world famous baroque painter Petr Brandl. There are also sculptures by Brokoff, Adrien de Vries, M. B. Braun and many other priceless and wonderful pieces. 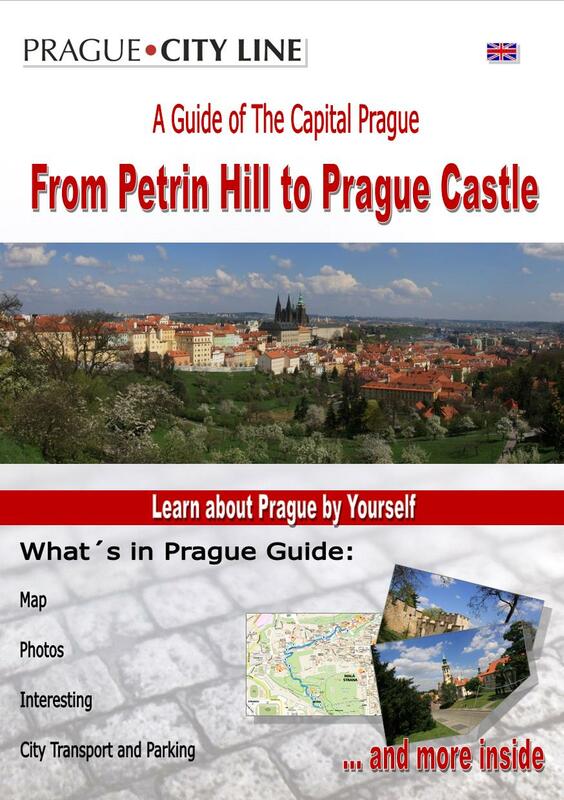 can be located behind the Convent of St George on the eastern flank of Prague Castle, right up against the ramparts. It is named after the goldsmiths who lived here in the 17th century. 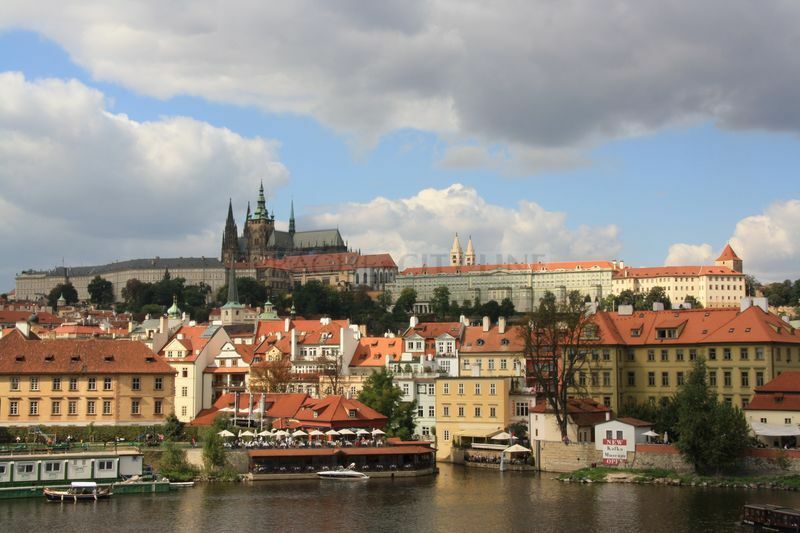 It is one of Prague’s most picturesque places and is shrouded in myths and legends, mainly about alchemists trying to make a stone of wisdom, which would transform ordinary metals into gold, and make its owner immortal. The Viennese professor Mr Uhde, who lived in the Golden Lane in around 1830, certainly fueled these legends. The professor was known for his eccentricity; he wore a long black coat that didn’t have a single button; he had a long white beard and in his small dwelling he regularly carried out chemical experiments, in an attempt to make a stone of wisdom. These experiments went out of control one night and there was an explosion and a fire. The professor suffered a stroke, but as he was dying, a smile came across his face as he held a nugget of pure gold in his hand. Alchemists certainly did work in Prague on the invitation of Emperor Rudolf II. However, they lived in Vikářská Street behind the Cathedral of St Vitus. The Golden Lane was home to the castle guardsmen, 24 riflemen who built their houses in arches in the ramparts. Later the lane attracted the poor and the name ‘Golden’ was used in irony as the place was so dirty. The inhabitants, it is said, had only one toilet and an open sewer ran down the middle of the lane. It wasn’t until the turn of the 19th century did its romantic side come to be recognised. The lane was renovated, and several famous writers lived here including Franz Kafka in 1917, who lived at No. 22, and the poet Jaroslav Seifert – winner of the Nobel Prize for Literature. During the reign of Emperor Rudolf II, alchemists had a laboratory in the Mihulka Tower. 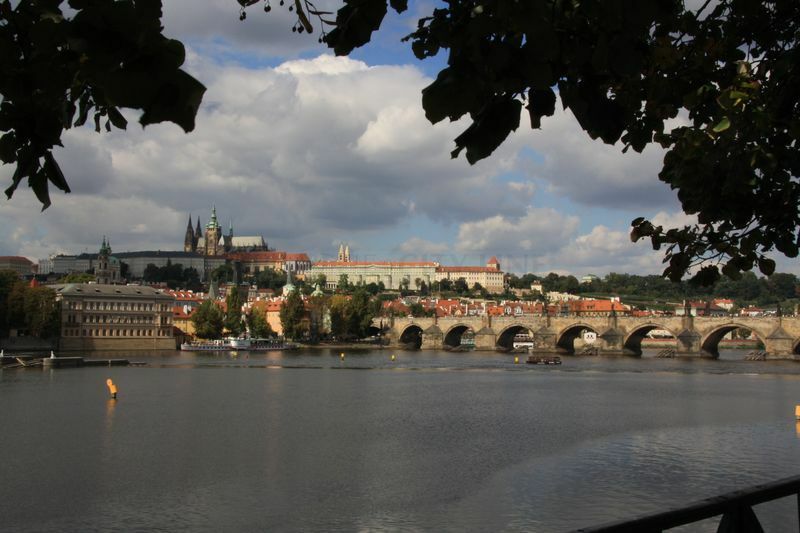 Today it houses an exhibition dedicated to alchemy, Renaissance metal foundries, various crafts, the late Gothic fortifications at Prague Castle and the beginnings of scientific research at the court of Rudolf II. 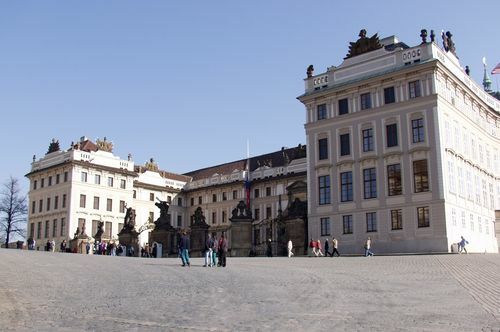 The Lobkovicz Palace next to the easternmost gate into Prague Castle was built after a fire in 1541. The remnants of the original Renaissance sgraffito can be seen on the outside of the building. Its current appearance dates from the 17th century when it was rebuilt by Carlo Lugaro for the Lobkovicz family. The grandest room is the banqueting hall dating from the 17th century with mytological paintings lining its walls. Opposite the palace rises the Black Tower, an original part of the castle’s Romanesque fortifications. In the 16th century the tower served as a debtors’ prison. The prisoners were allowed to bring personal items with them into the prison, and could even have people visit them, but they had to find their own food, sometimes by begging. Paradoxically, for a time the lender himself was responsible for feeding the prisoner, and if he died of hunger in prison, the lender had to fast as a punishment. PRAGUE CASTLE GARDENS The castle gardens spread out around almost the entire castle, and following extensive renovation, are once again open to the public. They are ideal places to relax and admire the skill of graden planners of the past.